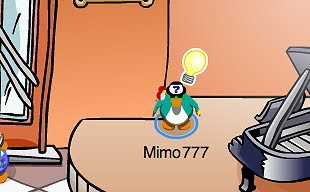 Club Penguin Cheats by Mimo777 Club Penguin Cheats by Mimo777: Club Penguin Pin Cheat - LIGHT BULB PIN! Step 2. Now go to Plaza. Step 3. Go into the Pizza Parlor. Step 4. 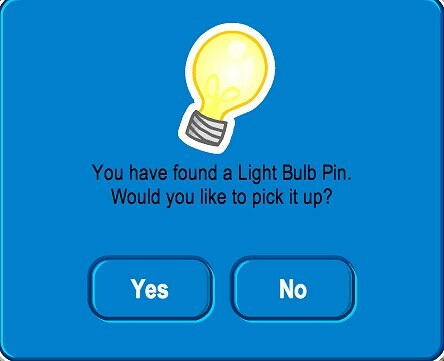 Now click on the LIGHT BULB PIN! THe party is here! i need help! Mimo's thinking bulb just went on, lol. Nice furniture... but barely any cheats! Cool thanks! I just started Club Penguin today and really needed the hat to find whatever was under that big red X.
I found a secret underwater room in Club Penguin! if you go to the hidden lake (where the pool usually is/was) on the note on the door it gives a hint to this, go into black puffle rescue and on the first level get the puffle then go to one of the side platforms, DONT end the level, a giant squid shadow should appear, using the bubbles to stay afloat, follow it to a secret area go over to the stairs and say enter, and wala! your in a secret CP room! and you can get the Moss Key pin! AND go in that door! That is very cool. Unfortunatly, Mimo has already posted about this. It was great that you found it by yourself though! Keep Commenting! Yep! Mimo made a really cool video to help everyone find it! I noticed that too! You need it to dig. The tresure item is really cool, don'tcha think? Sorry, but that's been there since March. Mimo has noticed and posted! But you're clever for figuring that out! They have been giving away hard hats alot lately. lol. They also got one down in the underground cave. Yea! Good find. Mimo made a youtube video walkthrough about that. Keep finding secrets. Mimo do you know that there are 2 new catalogs? Igloo upgrades and furniture! Just scroll down a few posts! There is everything about the pary! Yeah, they should've had something more piraty..
Lol! Then he lost it in the Pizza Parlor. :O I don't think that was in the news! Thanks dude! did anyone notice the herbert snowman at the mine shack? The light bulb pin goes good with the Gary background. This party is pretty cool. I don't know if I am being slow here or something but in the EPF headquarters go into the tube transport, it takes you to this wierd room that has the old HQs. i know this is kind of random but for your next contest like if you ever give away a membership u should do like an "oldest penguin contest"
my penguin is only 54 days old but i think that would be fun for all the older penguins! Thanks Bobhead202 I needed the hard hat for one of my new penguins and I thought I couldn't get it. I know I am not a member yet but I want to know something:I read that when you are a member you can have elite puffle.BUT YOU STIL NEED A CODE!Can you give it to me? P.S. I will be a member soon! mimo, in the boiler room it plays the night club music instead of the adventure party music. Sorry if I havent modded in a while it's just that its hard to find a question becuase all you see in the comments are mods who answer someone's question 1000 times. And mods just say this on people's likes... EG - 'Cool Pin From Blah Blah123' then a mod says 'Yes it is From Example321 CPG MOD' when its not a question. At the Iceberg, if you wait long enough you can see the Giant Squid's shadow from underwater. I wonder if it could be related to anything, or maybe just there for a decoration? I definitely wouldn't win. My penguin is only 2 days old! But it is a wonderful idea! Your not slow. I just found out about it too. It's only been there for a little bit. I'm so thrilled that we can still do the old missions and see the old Hqs! That is true. You can get the code by buying the Herbert's Revenge DS Game! That would be a great idea! Lol, my penguin is 735 days old! Yep, it's a new room! mimo i forgot this but it might take awile but its there. That's the VR room! Don't worry, I'm even slower! LOL! That'd be fun, but ppl wouldn't have much proof! He's having a contest now, it's pretty darn fun! Your completely welcome! Any time! You have to have the game Herbert's Revenge! Even if he gave you his, it wouldn't work. You can only input a code once. Sorry dude! Hey mimo theres a squid at the ice berg same time as you could see the puffles! Mimo! A gaint squid has been spotted at the ice burg! You have to wait a matter of time before you see it. P.S. I got this from someone I follow on twitter. ----------------------------------------sorry mimo already posted that it is called the VR ROOM! Your not slow! If you go down in the older posts Mimo has talked all about that! Hope i helped!